Brighton Ford : Abigail Is A Well-Behaved, Playful, 10 Year Old Girl Who Loves To Cuddle! 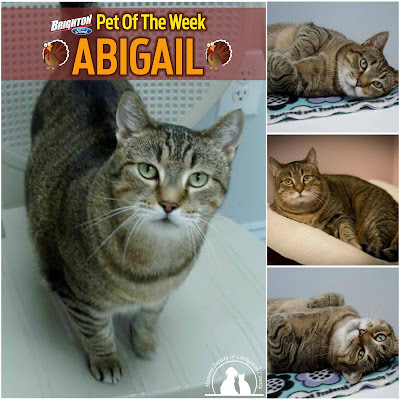 Abigail Is A Well-Behaved, Playful, 10 Year Old Girl Who Loves To Cuddle! My name is Abigail, or you can call me Gabby. I am a very friendly, confident brown female tabby who enjoys meeting new people. I am such a playful girl, you would never guess I am now considered a senior cat (born in 2007). You may be surprised and amused to see how my short little legs can jump off the ground -- keeping active has helped me keep my nice shape. I have never met a toy I didn't like, but my favorite is the laser light. Once I get some exercise, I will love to cuddle on your lap and be brushed or just relax with you. I am well behaved and know how to use a good scratching post too. I am great with people, but would do best in a home without other cats. I would be SO HAPPY to find a good home with someone to make me feel special again!